Dreaming of Footpaths: 30 mile training run: Can’t I just Get a Lift Home? 30 mile training run: Can’t I just Get a Lift Home? My back was sore, my knees were aching and I was grumpy. I was sure the paths would be flooded in front of me. I thought I’d probably need to stop for the loo sometime soon. I was grouchy and it was cold. I was 3 miles into my intended 20+ mile run and things weren’t going well. I couldn’t really call for a lift home from 3 miles away. Well I could. But it would be shaming. It would be like getting a lift to the end of a parkrun. Just to add extra grumpiness, I’d given up chocolate, alcohol and processed food for January so I’d had to leave all the Christmas chocolates, alcohol and pudding to everyone else. And then just to rub salt into the running, grumpy, wound, there in my path, shining like a beacon of sugary temptation was a Quality Street chocolate. Lying on the pavement, perfect in its shiny pink wrapper, tempting me. I’d like to point out that I’m not in the habit of picking up food from the ground. Especially not sweets of unknown source and vintage. But it was a STRAWBERRY CREME. The best of all Quality Street chocolates. Plus it was the 5th of January and I’d had no chocolate or sweets for 5 whole days. Swearing at the person who had laid it in my path, I jumped over it – while drooling - and resisted the urge to stop and shove it in my mouth, wrapper and all. Before I had left the house, I’d filled my running pack ready for a long run. I didn’t want to have any excuse or reasons to cut the run short and go home. 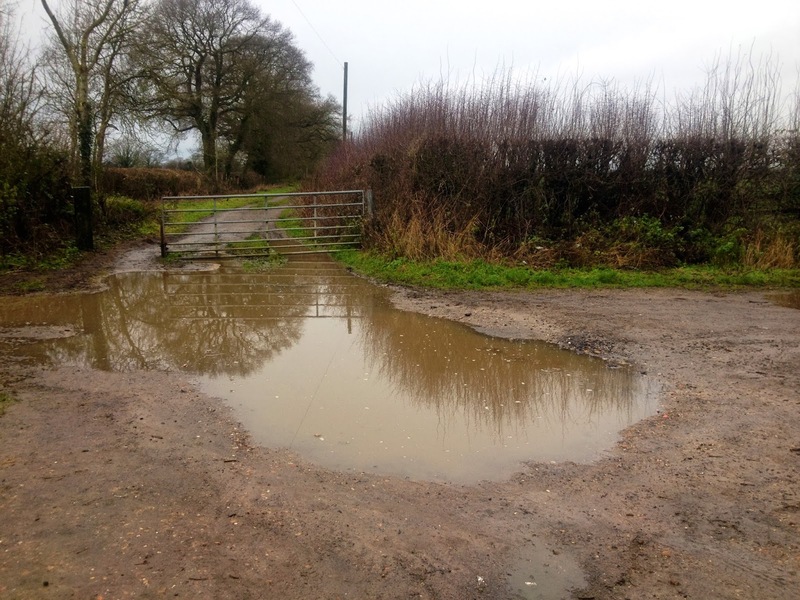 I only had a few weeks left until my 50 mile run and I needed to be as ready as I could be – barring the usual obstacles of dogs, toilet trips and rubber ducks – so I had tried to be ready for any eventuality this morning. The main 3 were in the back pack: Loo roll. Snacks. Money. While I didn’t want an al fresco poo, the loo roll was there should the need to jump in the hedge arise. I’d packed some things to eat so there was no excuse to stop for food at a pub ... and stop ... and stop. And I had money for coffee –which would double as a fare for a taxi home should my legs give up. I also had a banana sticking out of the side pocket like a sideways smile. I wasn’t feeling the running love today and my legs felt heavy and dull, but I just took it slowly. Today wasn’t about speed or pace but about getting some miles in, some time on my feet. I had snacks to occupy me, a water bladder in my backpack and a good audiobook to distract me should the route get boring. 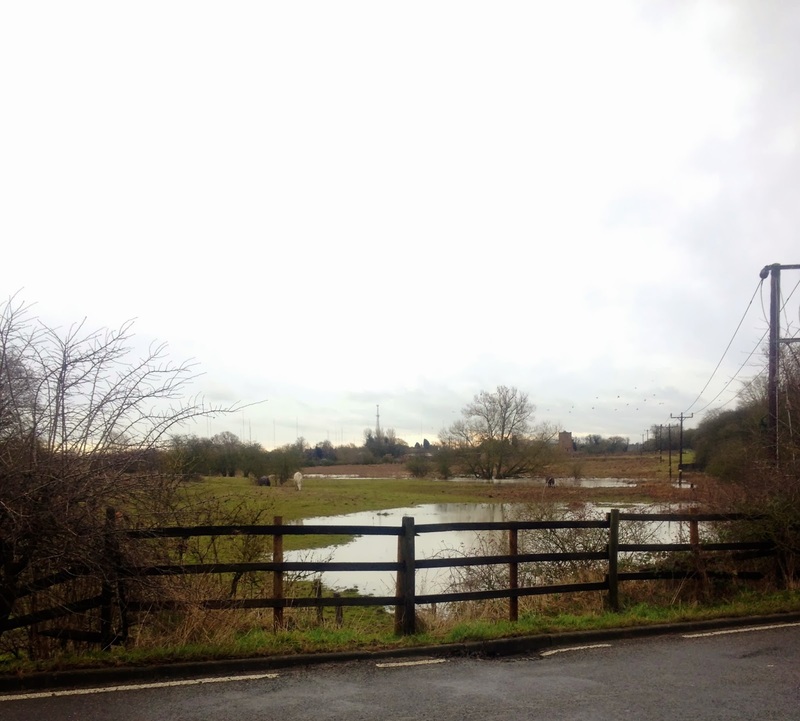 Unfortunately I would be running mainly on roads and pavements today as recent flooding had meant that a lot of the trails and paths were underwater and many of the fields were now sporting impromptu duckponds. And ducks. Still, that didn’t mean the views had to be dull. The Brownsover railway line trail didn’t look too watery so I risked running up it, jumping the puddles and enjoying the crunch of my feet on the gravel. I came out underneath the recently excavated viaduct and looked out across the fields. The sky was dull and grey but there were hours of daylight yet, ready for the running. Just needed to convince my legs. 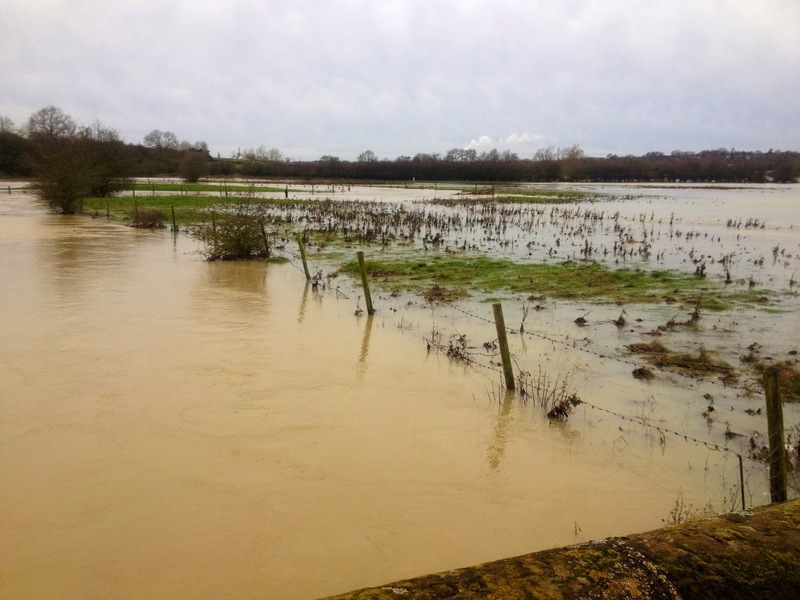 I passed quietly through the village of Newton and down past the St Thomas Cross and although the road wasn’t blocked, there were floods up to top of the little stone bridge and fields were under fast flowing brown water. My legs and brain ganged up and tried to convince the rest of me that the paths would be flooded, my routes blocked but I ignored them and carried on. If I could resist the pink Quality Street laid in my path, mutinous body parts were no problem. Up the hill into Clifton-Upon-Dunsmore and past the pretty church and into the hidden footpaths. Across the fields ... and sprint. I don’t tend to add in speed sessions going across fields, but there are shaggy cows with massive horns in these pastures and I worry that one day they might fancy a runner for lunch. They didn’t. Climbing the stile and putting a sturdy fence between me and the cows, I had a gentle trot across the grass and down the hill over the canal bridge. I’d expected this. It recently seemed to be an unbreakable law that applied to every run of mine over 4 miles. A familiar rumble from the tummy. Sigh. At least I was still within 6 miles of home and knew where all the pubs were. I lurched into the zombie shuffle at speed and made it into the pub. Paid for my loo stop with a packet of peanuts which were slotted neatly in my running pack and got back out onto the road. I was very impressed with my pack. I had been concerned when I’d received it as it looked tiny. (I’d chosen it online for a Christmas present) but once I started packing the food and bits and pieces in there was plenty of space and a multitude of pockets. There was a zip one on the front left which was great for essentials and the zip stopped me dropping pound coins and bank cards every time I bent forward to tie my shoe and there was a pouch on the other side for my phone. So no faffing about when the phone rang, when I wanted to change audiobooks or for checking twitter. I could even put hand into back pocket to retrieve snacks. Easy-access food. Brilliant. 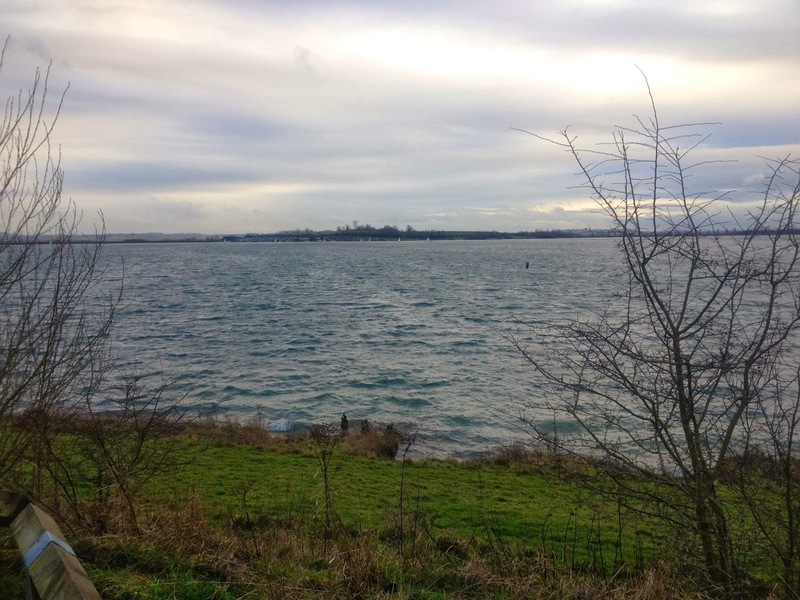 At just over 9 miles I got to Draycote Water which was my make-or-break point. 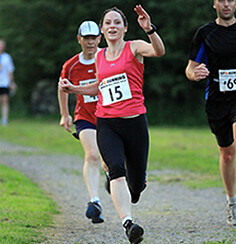 To get my distance in today I would need to lap the reservoir twice – each lap is 5 miles round. Soul destroying? Yes. But it was also the last challenge. After I’d done this all I needed to do was run home. But first ... again. The loo. Sigh. At least the pack had passed the “Can it hang on the back of a loo door” test. The reservoir is popular with walkers, runners and cyclists although dogs are not allowed. It’s like a small yap-less, dog-mess-free haven. No fear of being tripped by extendable leads or chased by a fuzzy snappy hound, simply of being mown down by an overenthusiastic speedy cyclist or overtaken by a speed walker. Or worse - a hiker. Maybe if I got mown down or eaten by a hiker I could go home and sit in the warm? On multiple laps you start by exchanging nods with the cyclists and runners, then as the laps pile up you end up practically on hugging terms. Today I was only doing 2 laps, but in the rain and cold but at least I was sharing the misery. Running in laps meant that I found a downside to my new pack. The front pocket has holes in the bottom to allow for strap adjustability. I didn't realise this and lost a cash and several snacks. Trotting around the reservoir dropping money and food, I must have looked like an out of order snack machine. However a benefit of doing laps was spotting the lost items (and therefore discovering the holes) on the second lap. I had a brief moment of optimism as the rain stopped. 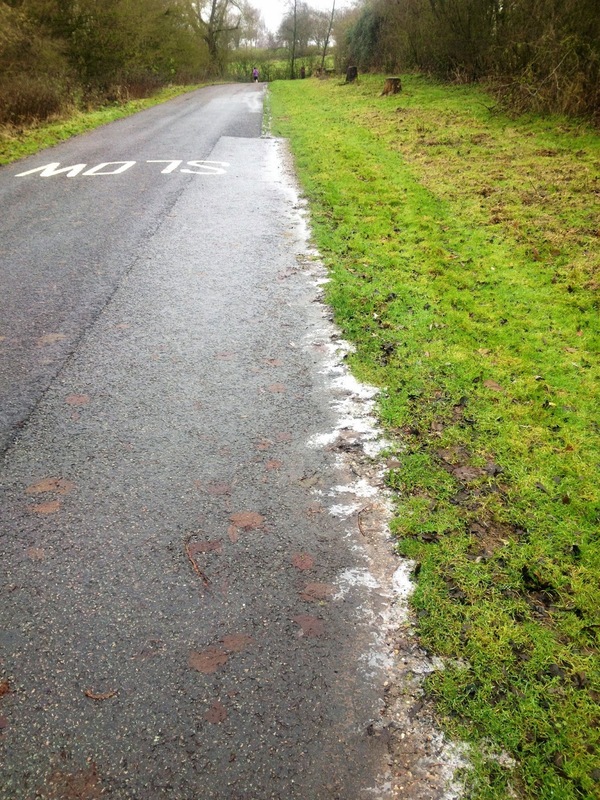 Then it started sleeting. I’d been cold for most of the run as I was going so slowly but now I was cold AND wet AND icy. It was time to replicate the ultra ‘Feed station’ stops and I stopped for a coffee and a chocolate crispy cake. Ah that’s the ‘No chocolate for January’ resolution broken ... But I justified the cake to myself by calling it Running Fuel. Not delicious delicious crispy cake. But I was now warmer and stopping for a while had given my jacket a chance to dry out. It was cold and I was still slightly damp and desperately wanted to call for a lift home. But I wasn’t going to do that in the ultra. So I couldn’t do it in the training run. I plodded on. There was ice at the sides of the path and the water was grey and stormy. There were waves on the usually calm reservoir and the ducks were nowhere to be seen. I got my head down and pushed on. I may be cold. I may be wet. But I have snacks. And I passed a loo every time I completed a lap. I could DO this. The running, not the loo stops. I’ve already proved myself there. And I was now on the home straight. Laps completed, I left Draycote Water with the light fading and the headlights of the cars lighting up the roads. Coming into the village of Dunchurch, I once again had to nip into the pub to use the loo. My stomach was obviously going for the record number of “Loo Stops During a Long Run.” This wouldn’t be so bad if all of these stops were for mulled wine or for peanuts but at least I was getting a nice sit down. The daylight disappeared quicker than I'd expected so I changed my route on the way back. I wanted street lights rather than running in the dark so ran back through the centre of Rugby. The audiobook was turned off and running songs were turned on. And I promptly started run-dancing to good songs. Hmmm ... maybe this long run lark wasn’t so bad after all. If I could do the Time Warp after running 20+ miles, then surely running 50 while NOT doing the Time Warp would be a breeze? I arrived back in my street, in good spirits and wet clothes to find I was .75 of a mile short of 30 miles. I started the Runners Misery – the laps of the streets surrounding their house that every runner knows and does to make up the distance to whole miles. If taking loo roll on long runs is the first runners law, then “Thou shalt not have less than whole numbers on thy Garmin” is surely the second. I arrived home – the second time to find a hot bath and a cup of coffee waiting for me. The 3rd rule of running. “Phone Ahead”. You definitely made things hard for yourself! Two five mile laps in the middle of the run and an extra 0.75 on the end?! I probably would have made it up to finish on a round number but if I'd sat down for a coffee and cake in the middle that would be me stopped for the day. And I would have probably ordered more cake! I just commented and for some reason its disappeared ha ha, so be warned if you get 2 comments! Well done! Those marathon-plus training runs are always hard, but I found they gave me confidence for race day and, come the event, I knew my body wouldn't fall apart if it ran over 26.2 miles. I always carry emergency loo roll but am yet to use it, fortuntately. 30 mile training run by yourself.....I just don't know how you do it!! What an inspiration. THat last .75 miles must have been HELL!